Are Stretch Marks During Pregnancy Predictable? Developing stretch marks during pregnancy may be seen as inevitable or unpredictable. 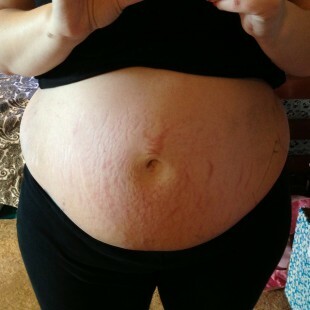 Nevertheless, stretch marks are an aesthetic concern during pregnancy. Until now, risk factors for stretch marks (striae gravidarum) have not been consistently identified in the literature. A recent study in Rouen, France analyzed predictors for the development of stretch marks during pregnancy. 800 first-time mothers were examined postpartum for the presence of stretch marks by the same dermatologist. The authors found 56% of the study participants developed stretch marks during pregnancy; most commonly on the abdomen (70%), hips and thighs (41%), and breast (33%). The strongest predictor for developing stretch marks was younger age during pregnancy. 84% of women younger than 20 years developed striae gravidarum, as compared with 24% of women aged 30 years and older. Other significant predictors were: higher pre-pregnancy weight and body mass index, higher weight at delivery, higher gestational weight gain, Fitzpatrick skin types I and IV, and a family history of striae gravidarum. Twin pregnancies, the baby’s birth weight, and a slightly longer gestation time were also associated with stretch marks. Overall, this study shows that occurrence of stretch marks is not only associated with young age and family or genetic factors such as family history and skin phototype, but also with risk factors such as pre-pregnancy weight and weight gain during pregnancy. These risk factors may support effective patient counseling, especially among younger women, to prevent occurrence of stretch marks during pregnancy.